For Seawater Pearl Powder GO HERE. Freshwater Pearl Powder Is Made From Unpolluted, 100% Fresh Water Pearls, 100% Pure, Premium, Medical Pharmaceutical Grade. Pearl Powder's anti-aging health-beauty benefits are more than skin deep. Rich in vitamins, minerals, and amino acids that benefit the skin, Pearl powder has a lot more to offer than its beauty as an adornment. China praises these precious gems for their anti-aging properties. It has a magical effect on the human body; the health and beauty benefits are staggering. Taken internally or applied externally, Pearl Powder brings a radiance to the skin and hair and makes it soft, shimmering and dazzling. It provides miraculous medicinal properties to the body and stimulates healing. Pearl Powder stops and even reverses aging. Pearl Powder is an Ancient Chinese beauty secret that has been used for over 3000 years for lustrous, beautiful skin and good health...a treasure that was used for centuries by Asians, Egyptians, Chinese, Mayans and Indians for health and youthful vitality, as well as for beautifying the skin. It is renown for fighting wrinkles and the signs of aging and leaves a luxurious sheen to the skin. Unbeknown to many, Pearl powder is a "Secret ingredient" in many of today's top selling skin care creams and lotions. 100% Fresh Water Pearl Powder For Wrinkle Free Skin & Longevity - Premium, Medical Pharmaceutical Grade. What is Fresh Water Pearl Powder? Freshwater pearls are farmed and grown in freshwater mussels. The irritants and the oysters used in making freshwater pearls are smaller than saltwater pearls. Freshwater pearls live in lakes, rivers, ponds and other bodies of fresh water. Saltwater pearl grow within pearl oysters and are cultivated in protected lagoons or volcanic atolls. This Pearl Powder is rich in amino acids, minerals, calcium carbonate crystals and the protein conchiolin, whether made from freshwater or saltwater pearls,. Conchiolin are complex proteins that gives pearls their radiant shine. When applied topically there are amazing skin benefits including acne treatment and contains a skin lightening agent, including anti aging benefits. It is well tolerated by sensitive skin types. Due to advanced technology for cultivating Freshwater Pearls, China has become the largest producer of Freshwater Pearl Powder in the industry, supplying approximately 95% of the Pearls in the world. Chinese Cultured Pearls excel the quality of the most valuable Pearls found. The Pearls are ground into a powder that is very close to nano-size by advanced biological technology, converting original calcium carbonate and protein into reactive calcium and amino acid. Water solubility reaches 100%, so the powder is easily absorbed and utilized by the body, providing a array of innovative elements that promote radiant health and longevity. Every batch is processed to the finest consistency for best penetration, then disinfected and laboratory tested. Uses a rare and superior quality of cosmetic grade, fresh-water pearl powder direct from China pearl specialists. It is rich in minerals, amino acids and coenzymes which makes it a prime anti-aging treatment. Our Freshwater Powder Contains dozens of minerals, 17 amino acids including lots of reactive calcium, calcium carbonate, microelements calcium, magnesium carbonate, titanium, iron, zinc, copper, selenium, silicon, strontium, phosphate, ferric oxide, silica, etc. It is made from purified, finely milled Freshwater Pearls that are rich in essential amino acids, unique anti-aging signal proteins, calcium compounds, and trace minerals. Its naturally compatible and easily absorbed by the skin and body. The medicinal and beauty benefits of pearls have long been known to the Chinese, proven non-toxic and harmless to ingest and apply topically to skin. It clears away toxic materials from the body. It enhances the immune system and complements calcium by adjusting and rejuvinating the skin, stimulating new cell growth and renewing the skins surface making it smooth, soft, elastic, and radiantly beautiful. Used externally for skin care, and orally as an anti-inflammatory and detoxification agent. Used internally, Pearl Powder detoxifies the system; Cleans and clear the skin; Removes age spots, dark spots and liver spots, gives the skin a more youthful appearance; Adjusts the body energy; Calms the liver; Relieves stress, treats sore throats; calms the nerve system; Regulates the metabolism; Improves eyesight, treats insomnia, and energizes the body. When used topically, this Pearl Powder makes skin smooth, soft, and lustrous looking. Additionally, it is used to treat open sores, burns, and cuts, and also it cures a fever. It is widely used as a treatment for acne and has purifying effect on the skin. It is good for sensitive skin, and fades acne scars. Pearl improves brain function, high blood pressure, heart function, skin, eye sight, bones, teeth, joints, sleep, anxiety, depression, stress, and much more. The secret ingredient in pearl is Conchioline which are complex proteins, the outer shell layer called periostracum is composed of the protein conchiolin. It converts into collagen and combines with Epidermal lipids, important factors in the skin's moisture balance. It forms a cement-like barrier to prevent water from escaping which retains the skin's moisture balance, leaving a beautiful glow, a lovely illumination on the skin. It acts like keratin to repair damaged skin cells, hydrate skin cells, promote skin cell metabolism. Increases SOD activity - Primary Antioxidant, reduces lipofuscin production, which slows aging, cleanses free radicals, and reduces the oxidative degradation of lipids. Simultaneously, SOD and Glutathione have been Proven to strengthen the immunity. Glycine - an essential amino acid that serves as both an inhibitory and excitatory neurotransmitter. Forms insoluble collagen fiber to moisten skin internally and tone the skin. Methionine - an essential amino acid that contributes to the skin�s radiance and elasticity as well as the conditioning of hair and nails. Glycine & Methionine are essential ingredients to produce new skin cells. Taurine - Repairs damaged skin cells, rehydrates keratinocytes (the main cells of the upper skin layers), re-hydrating skin cells, reduces free radical damage, increases circulation and purifies the blood for clear radiant skin. Calms the nerves and regulates the menstrual cycle. Polyacrylic acid - Super-Hydrates skin cells, repairs damaged skin, retains moisture, increases elasticity, and softens the skin. It rejuvenates the skin as it represses the development of wrinkles and freckles. Alkaline Phosphatase - a protein found in all body tissues including the liver, bone, kidney, intestine and placenta. It also plays an important role in the growth and development of bones, skin and teeth. It is essential for the process of mineralization, in which minerals such as calcium and phosphorus are deposited in developing bones and teeth. This prevents epidermal aging and deterioration of cells and increases the vitality of the skin. All 17 Essential Amino Acids - boost skin metabolism and speed up cells absorption of nutrients. These essential building blocks of collagen and protein each have a specific function. Lacking any one of the key amino acids causes the skin to look dried, old and wrinkled. Researchers claim that various components of pearl can stimulate the metabolism's activities of the genetic material in a cell - the DNA and RNA - thus promotes and accelerates the regeneration of new cells. Keeping the DNA molecular structure intact ensures the maximum amount of nutrients and proteins are absorbed by the body. What makes Our Freshwater Pearl Powder So Powerfully Effective? To ensure high quality and efficiency, our Pearl Powder is produced in their own manufacturing facility. They control where the pearl is collected, and their patent-pending processing technology makes certain that all the key ingredients and signal proteins are preserved and enhanced. They have strict quality-control standards in place to ensure the safety and effectiveness of the product. The active components in each batch are tested by full-spectrum high-pressure liquid chromatography (HPLC) before and after processing. Our Pearl Powder is guaranteed to be completely free from any heavy metals, toxins or harmful chemicals. Tested to be free of heavy metals and contaminants down to the lowest detectable amount. The pearl that is used is 100% fresh water, cultured pearl, tested to be pure and effective; processed to the finest consistency for best absorption, then disinfected and laboratory tested. 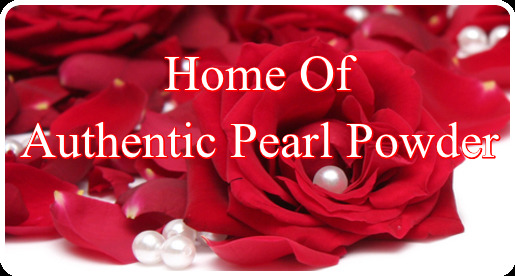 Uses a rare and superior quality, fresh-water pearl powder direct from China pearl specialists. Freshwater Pearl powder contains polysaccharides, vitamin B complex, 17 amino acids, a variety of trace elements, minerals and proteins which allow the skin to regenerate as well as strengthen the tone. It is known for its skin lightening and softening abilities. It treat dark spots, age spots, hyperpigmentation, freckles, discoloration from scarring and blotchiness, reduce blemishes, heal rashes and irritation to the skin. It leaves your skin with a significant radiant glow. Pearl is a pure source of calcium and does not cause calcification. All store bought calcium pills cause calcification. Calcification is the buildup of calcium in tissues where it does not belong, resulting in the hardening of tissue, that can be unpleasant or dangerous. Calcification can occur in the breast tissue, the coronary arteries and in the heart valve. Dead and degenerated tissues can also be affected. The results: joint pain, arthritis, kidney stones, cardiovascular problems, cataracts, cellulite, and cancer! Calcium carbonate in Pearl Powder, when taken internally, strengthens bones, muscles and nerves. In fact, Scientist revealed that pearl can activate new bone foundation and development, and increase bone mineralization. Pearl taken internally slows down the aging process, build cells, protects us from bacteria, viruses, and the development of cancer cells. Scientific studies show Pearl Powder to be the finest source of calcium available. It was absorbed nearly twice as well as regular calcium carbonate with vitamin D in a double-blind crossover study. French scientists have proven that pearl can reduce bone loss. Chinese scientists have also discovered that calcium from pearl is more easily absorbed by the body than calcium pills. Pearl has a significantly higher bone mineral density (HBMD), higher bone calcium content and higher total bone weight that regular calcium. Scientists have discovered that pearl is one of the most effective ways to prevent osteoporosis. The DNA involved in the creation of peal is nearly identical to the part of the human DNA that is responsible for the regulation of calcium metabolism in the human body. "Osteoporosis, which means "porous bones," causes bones to become weak and brittle - so brittle that even mild stresses like bending over, lifting a vacuum cleaner or coughing can cause a fracture. In most cases, bones weaken when you have low levels of calcium, phosphorus and other minerals in your bones. A common result of osteoporosis is fractures - most of them in the spine, hip or wrist. Although it's often thought of as a women's disease, osteoporosis also affects many men. And aside from people who have osteoporosis, many more have low bone density. It's never too late - or too early - to do something about osteoporosis". Definition by Mayo Clinic Staff. Pearl Powder will keep your bones strong and healthy throughout your aging years. What mysteriously lies deep within the pearl has the power to renew and restore the entire human body. Pearl Powder dramatically reverses the aging process: It suspends the evidence of time. You can actually turn back the hands of time with our Premium, Grade A Pearl Powder. Fresh Water Pearl Powder - Premium, Grade A For Wrinkle Free Skin & Longevity Studies in China have proven that Pure pearl powder enhances the activity of super oxide dismutase (SOD), the antioxidant enzyme which quickly and thoroughly removes melanin or pigmentation, thus to make skin whiter and brighter. It will not however, if you are a person of color, whiten the overall color of your skin. And because SOD eliminates free radicals, skin aging and wrinkles thus can be prevented. Royal inhabitants of the Chinese Imperial Palace swore by the miraculous rejuvenating effects of pearl powder, which they used for healing and skin brightening. and promote radiant, youthful-looking skin. Nourishes the skin and makes it smooth, fine, elastic, healthy and naturally beautiful. restoration, as well as neutralize skin-damaging free radicals. rhythm which aids in the recovery of heart disease. Alleviates fear, eases frustration and anger and Improves sleep. Strengthens bones, stimulates new bone growth and increases bone density. Accelerate the healing of trauma, fasciitis, gastric and duodenum ulcers and stop bleeding. Resists aging, cancer and the harmful effects of radiation. removes toxic substances from the body. Stimulating new bone growth and increasing bone density. Whitens teeth and noticeably improves receding gums. Reduces the risk of heart disease, diabetes, and cancer. Superior source of calcium and essential trace minerals. heals acne within 1 week. Pearl Powder is The Ultimate Facial Secret and Body Treatment. It removes the top outer layer of dead epidermis cells, exposes the supple layer of smooth skin and promotes new cell regeneration. It leaves your skin more receptive in receiving skincare products. It gentler and more effective than Microdermabrasion. Applied on the face and body, it makes skin soft, super silky and shimmering; applied on hands and feet, it smooths and softens dry and flaky skin. You can pamper yourself with a Luxurious Pearl Powder Spa Treatment. in the comfort of your own home at a fraction of the cost. Pearl has other interesting medicinal properties and healing powers. In China, pearl powder is used to heal wounds because of its antiseptic properties. In the United States, surgeons frequently sprinkle a lower-grade pearl powder, called surgical pearl, into their latex gloves before operating. The soothing, antiseptic pearl powder absorbs excess moisture and may help prevent the spread of infection. Traditional Chinese medicine (TCM) uses the medicinal qualities of ingested powdered pearl to treat inflammatory illnesses including epilepsy, convulsions, hyperactivity, hypertension, insomnia and palpitations. Pearl powder sprinkled into shoes helps absorb odor and excess moisture. Pearl has been used to treat ulcerous sores by sprinkling the sores with the powder. Pearl Powder stimulates restoration, and growth of connective tissue, including tendons, ligaments, and the layer of fibrous tissue that surround the skin, muscles, and organs. Pearl powder helps you recover from injuries, strained muscles and tension more quickly. Pearl will keep you young looking and healthy throughout your aging years. Be sure when you buy Pearl Powder you buy 100% Pure, Premium Grade, Ultra-Fine Fresh Water Pearl Powder. How safe is our Premium Pearl Powder? 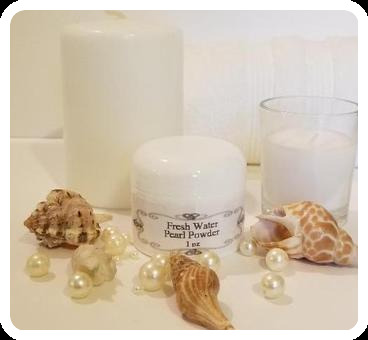 Our Premium Fresh Water Pearl Powder is all-natural, pure, medicinal grade and nourishing. It is 100% safe to take on a daily basis. Depending on the taste buds, pearl powder can have a mild fish like flavor, or none at all. Some people experience a slight fishy flavor within the aftertaste. Authentic, Premium Pearl Powder does not contain enzymolysis (Chemical change or cleavage of a substance by enzymatic action which removes the taste of fish) thus Authentic, Premium may have very slight taste of a fish. Our Pearl Powder is Chemical, enzymolysis Free, with no Shuck or Gypsum added - It is Pure, Authentic, Real - Not Fake.